As a Naturopathic Doctor, I take an individualized approach based on your goals and your unique health situation. I truly want you to thrive and feel great so you can enjoy your life. I work with you to develop a realistic and achievable plan that you can feel good about. Whether you have a specific medical condition, generally don’t feel as well as you used to, or would like to take more of a proactive approach towards a healthier and happier life, I am here to help. I believe it is important for you to feel comfortable with your healthcare practitioners. For this reason, I offer a complimentary “Meet the ND” visit. This 10-15 minute free intro session gives you a chance to meet me, ask questions you may have about my Naturopathic approach, and find out how I can help you. Phone or click here to schedule a complimentary telephone or in-office consultation or to book an appointment. I look forward to meeting you. 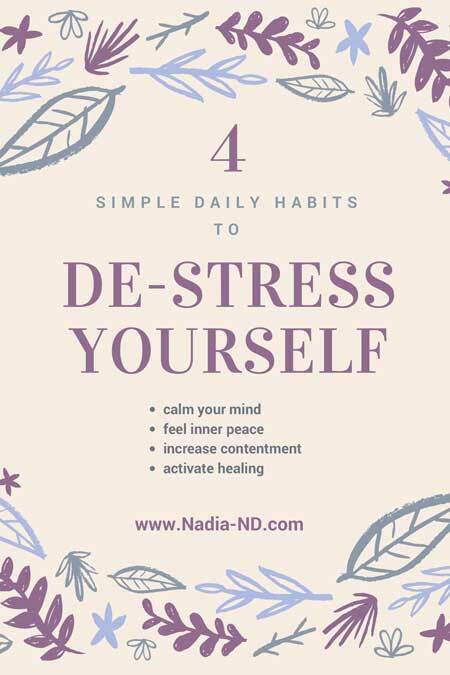 Sign up here to get my free "De-Stress Yourself" guide and occasional e-newsletter with natural health info, articles and updates. By signing up for this newsletter, I consent to be contacted by Nadia by email. I understand my contact information will be kept confidential and never sold or shared without my express consent. I understand that I can unsubscribe anytime.